Recently, we acquired some excellent products from the good people at Heartbreaking Dawns, including a hot jam/chutney, hot sauce, and hot rub. I decided to try some of the Jalapeno Pineapple Hot Sauce on a batch of chicken wings and legs, and was not disappointed. 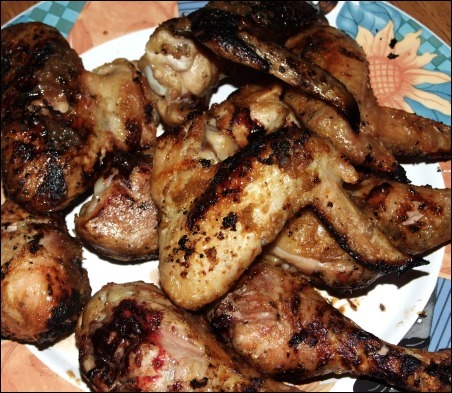 I barbecued the chicken on the outdoor grill – I coated it with a little oil and garlic powder at first and cooked about 3/4 done before brushing on the hot sauce.I used a very light touch with the sauce since it’s pretty potent, and I’m definitely not the bravest hot sauce eater out there. 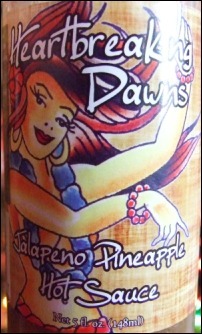 The Jalapeno Pineapple sauce has a distinctive sweet, citric flavor which greets the tongue first. It’s immediately followed by the kick (that’s an understatement) of jalapeno and habanero peppers. The overall flavor was delicious, enhancing the chicken without overpowering it, with a spice that’ll leave your tongue and lips tingling with heat. I’ve already been thinking of recipes I can add this sauce to. I have a teriyaki sauce variation which it should compliment nicely. I think it would also go really well with kielbasa. One final note, the ingredients in the sauce are all quality, with nothing you can’t pronounce. And there are no artificial preservatives, MSG, HFCS, or any other evil initials you can think of. If you love hot sauce, this will be a variety you’ll like to try – something a little different. Their website is Heartbreaking Dawns – check out their entire product assortment – gift packages also look to be available right now as well.